The Stand ‘n Play Rampway introduces toddlers and preschoolers to new Little People vehicles - perfectly sized for them - in a ramp-filled town with tons of action-packed vehicle fun. 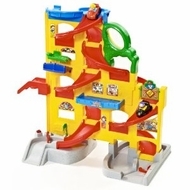 Set is over 2-ft tall, anchored by 2 rolling ramps with places to play on both sides and plenty of twists, turns and tunnels all the way down. Stop at the repair shop for a tune-up-load vehicles onto lift and raise up and down for mechanical cranking sound effects. Send cars through the flipper sign-it spins around when vehicles hit it. Park at the meters to visit the shops or head to the drive-through restaurant. Bottom level has parking garage with vehicle-activated lift ‘n lower gate and gas pump with rotating hose activating fun sound effects. Adjoining lift/lower stop sign activates lights - push sign down for red stop light and lift sign for flashing lights and car action sound effects activated as cars zoom by. Load cars onto the clicking elevator to bring it to the top all over again. Comes with 2 new LP mini-vehicles (Sports car and Formula One racer), perfectly sized for little hands, each with 4 wheels and familiar LP character built right in.